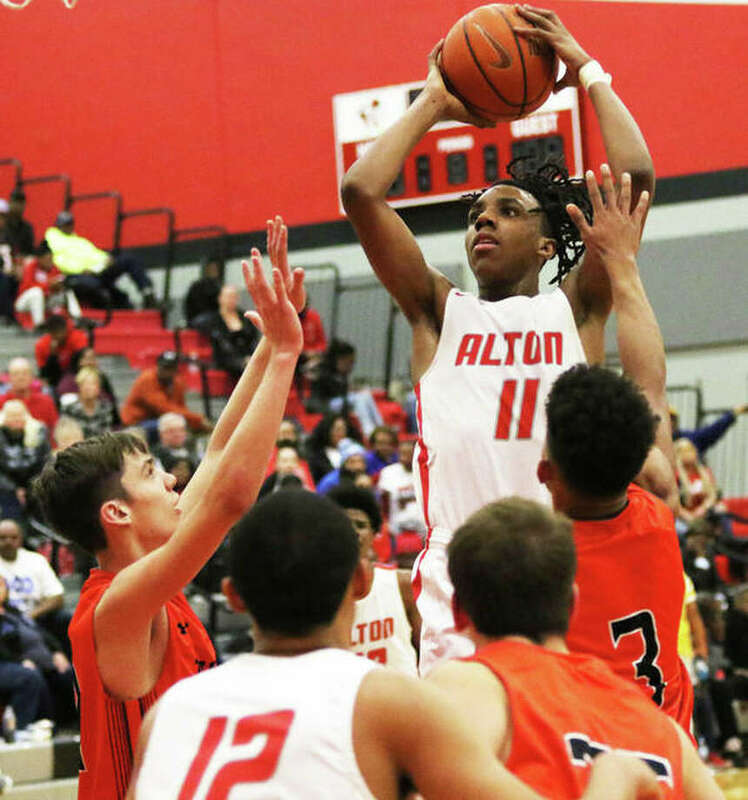 The 2018-19 Shootout Tour for Alton Redbirds boys basketball hit Galesburg on Saturday night. And the Redbirds benefitted from some late drama to beat the Rock Island Rocks 59-55 in the Galesburg Shootout at John Thiel Gym. It was the third straight shootout victory for Alton since a Dec. 15 Ramey Shootout loss to Jennings in Webster Groves. The Redbirds beat Maine South at the Taylorville Shootout, Soldan at the SLUH/MLK Classic and now the Rocks to push Alton’s record to 16-8 and extend its winning streak to six in a row. The Redbirds are back in shootout mode Friday to play Springfield Southeast at the Bank of O’Fallon Shootout at Panther Dome in O’Fallon. Southeast, ranked No. 3 in the Class 3A state poll, lost at Belleville West 74-73 on Saturday night to drop to 18-2. Donovan Clay led the Redbirds past the Rocks in Galesburg with 23 points and seven rebounds. Alton, which led 24-23 at halftime, trailed by six points before getting within 39-38 after three quarters. Rock Island would regain a six-point advantage at 44-38 before the Redbirds responded with a 13-3 run to go up 51-47. Alton’s lead was 51-50 with 26 seconds left when Clay missed two free throws. But a bench technical assessed on the Rocks, protesting an intentional foul call committed on Clay’s shot, sent Malik Smith to the line for two makes. A basket on the ensuing possession pushed Alton’s lead to five and the Rocks’ late surge came up short.